Happy retirement to Dad and his printer. My mother, sister, and I pestered Dad for years about retiring. He was an accountant for 48 years, his clients mostly small business owners operating along the southern border of Vermont and New Hampshire. It was a family business. Mom worked the front office for 25 years, and my sister and I helped out during the summers. I worked with my father for six-months after I graduated, and learned more about being a real-world CPA during that short time than I did in all the years spent at college. He inspired me to start my own accounting firm. Dad’s office was a fixture on Main Street, but, after nearly 50 years, it was time to close the tiny place down. It was hard saying goodbye to Helen, my father’s “right-hand man” and “work wife” for the last two decades. But harder still was saying goodbye to Dad’s Brother laserjet printer. Dad’s been a “Brother Man” since the 1990s. Every couple of years he’d get a new Brother printer. My sister and I printed all of our school reports on a Brother. I printed my college applications and my first job resume on my Dad’s Brother. Based on the volume of Dad’s business, he’d sometimes print up to 50,000 pages per month. Go, Brother, go! Dad’s latest Brother was a MFC-L6700DW All-In-One he bought 18 months ago. The saddest part of packing up Dad’s office was unplugging his beloved Brother printer. 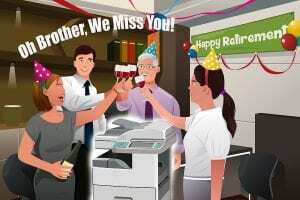 It was like the hum of the printer was the pulse of Dad’s business, and once it stopped, his business was really over. Another accountant from across town bought the printer, but, for reasons none of us understood, didn’t want the extra toner cartridges that came with it. Who knows? Maybe he’s got a great source for genuine OEM toner. Whatever the reason, my sister and I were left with several extra boxes of Brother TN-820 toner, TN-115 toner (cyan and yellow), and a DR-510 Drum. My sister was ready to toss everything in the Dumpster when I stopped her. “Maybe we can sell Dad’s unused toner online,” I said. My sister thought it was a waste of time, so I took it upon myself to sell the unused toner online. A quick web search brought me to Cash4Toners. It only took a couple of minutes to complete the online form letting them know what toner I had for sale. They got back to me later that same day and offered to take everything I had! Plus they paid for shipping! I’m tempted to pocket the money and cut my sister out completely. After all, she wanted to throw our genuine Brother toner in the trash! Instead we’re using the money to buy Dad a new fishing pole and tackle box. He needs a hobby now that he’s retired!